We love traveling as a family, hence it’s not just about seeing the place, it’s also about ensuring that all members enjoy the travel. If you are travelling with small children and if the trip involves travel for long hours then it is important that you are well prepared for it. The one thing I swear by is lists! I am obsessed with lists and I love-making them 😛 So here is my list to pack when you are travelling with kids on a long flight! It can be tough to find documents like tickets or passports with two adrenaline pumped kids. Keep travel folder that includes all your important documents of the whole travel like tickets, passports, identity cards etc. handy. It is great if your folder has sections where each travel can be segregated. Food is something that can make a parent’s life peaceful. Ensure that you stock up on healthy food items that kids can easily pick and eat. If you are on a long flight, the flight usually takes off at odd hours. Usually kids are sleepy when the flight takes off and when in-flight meals are provided kids are either asleep or least interested in eating. Having healthy options like a fruit, granola bars, paratha, sandwich, khakara, dry fruit or trail mixes, healthy biscuits etc. handy will help you give kids something healthy when they are hungry. A well fed kid is definitely easier to handle than a hungry, cranky one! Usually long flights do have in-flight entertainment however short flights might not have in-flight entertainment. Again, at times kids might not find it interesting, so it’s better to carry your options. I usually ask my kids to give me 2 things that they want to carry on flight. The criteria for the same are simple – it should be non-intrusive and easy to carry. Usually my kids bring their favorite story book, small vehicles or handy puzzles. Apart from this I keep activity books and colors, a few loose papers to make some paper craft and a tablet with enough downloaded entertainment. If your kids are toddlers or babies, it makes perfect sense to rent a stroller. Owning a handy foldable stroller is also a good investment, if you travel frequently. Most airports have a stroller renting option. Just check at the check-in counter to be directed to the place. 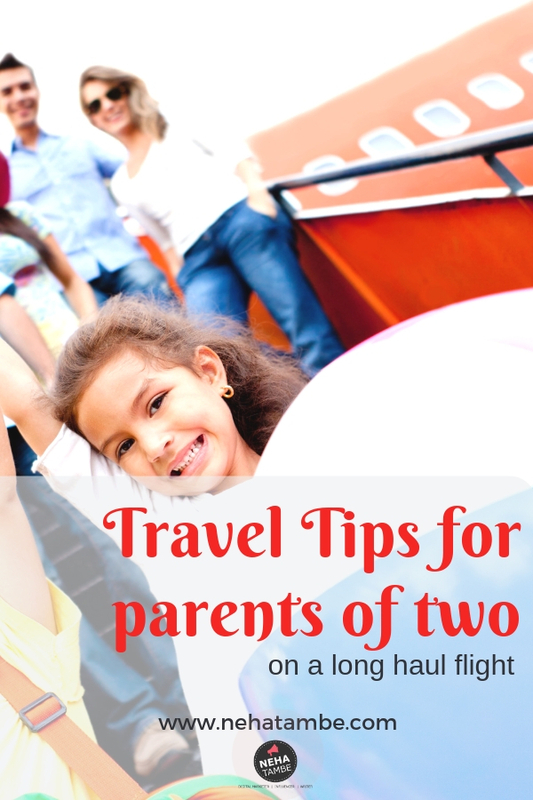 This ensures that the kids are not tired because of the long walks and immigration process that usually takes place around the flight take off time. It also ensures that the kids sleep comfortably. As the strollers can be taken till the boarding point, the child is comfortable and you have your hands free for finishing the immigration process. Most of the connecting flights usually transfer your luggage internally till the final destination, however the terminals where you need to get on board might be far. In the meantime if the child has to go to the washroom or wants a fresh set of clothes, anything less than 2 hours will be very tight. It is better if kids have some time to stretch and run around as long flights can get boring. It is okay to be ready and waiting at the gates that running in and missing your flight. With the time difference and long flights, it is tough to feel fresh. Keep your oral hygiene products and spare clothes handy. This will help you stay fresh and keep children fresh and perked up for the next leg of the travel. With small kids, there are high chances of bathroom mishaps or spillage. Spare clothes help in such situations. Eye masks and travel pillows can be great if you have to catch a few winks while waiting for your next flight. It is also perfect if the kids are already asleep in the flight and you don’t want them waking up because of the regular changes in lights during landing, take-off etc. This is a common problem, that effect young and old. Avoid travel if your kids or you are suffering from severe cold as blocked nose can make air travel much more difficult. On other days, keep chewing gum or solid candies handy and give them to children as the flight takes off or during landing. Keep checking if kids can feel some pressure being built up in the ear. Ask them to yawn or make regular jaw movements to aid release the air pressure. For babies or toddlers, let them sip on some water or juice. Keep kids hydrated during the long haul. Water is generally ignored and that can get them worked up at the fag-end of the travel. The key is to keep them hydrated and remind them to take regular bathroom breaks. Acidity, sleeplessness, bloating, ear pain are some of the problems that young and adult might face when on a long flight. It is better to keep your regular medicines handy and accessible to avoid discomfort. These are few of the tips that I have found useful when on a long flight. How do you plan your travel with kids? Do share in comments below. Travelling with kids is always tricky, be it short haul or long. I am glad to see you have mentioned ear discomfort as this is one things kids mostly suffer from in flights. You have covered all the points so well. That’s quite a detailed list and definitely will come handy for the travel. Ear discomfort is something I wasn’t prepared for in my current travel for my toddler and it was such a hectic flight for us. I am saving it. This is such a detailed post.. I am definitely gonna saving it. Last time i had a hectic time while travelling with my son..
this is a very good and compiled list of things to be taken care of while travelling with kids. also really essential for parents who love to travel. You covered it all Neha. We travel often and long flights with kids need planning and plan B in hand always. Traveling with two kids is very tough. This will be a great help for me later. Entertainment needs to be handy. This post reminds me of my journey from Netherlands to India with my elder one in my hands and the younger one in my womb!! Many of these tips actually helped me back then. ear pain is somethin that kids get during take off and landing. I always ensure my little one is keeping his jaws moving. You have mentioned very valid points Neha.